Finally, after years of preparation, dreaming and scheming (it’s not impossible to leave 11th grade at your public high school, but it’s not exactly encouraged either) we set sail on Shanachie again in November 2004. We headed south during what must have been the coldest California winter on record, and never quite warmed up again until Cabo San Lucas in Mexico, though it even seemed chilly there. Because we wanted to “just get warm,” we opted out of cruising north again into the Sea of Cortez this time, and headed further south instead. 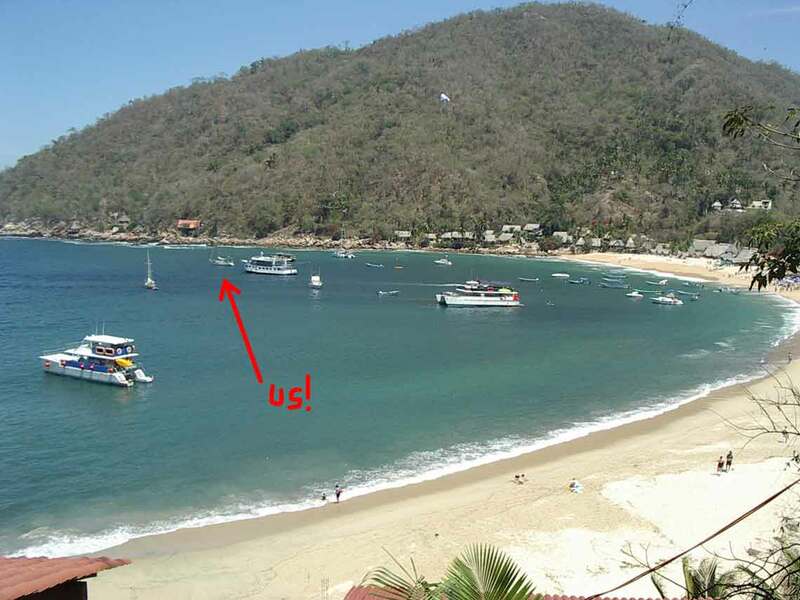 Most of our time in Mexico was spent in the area of Tenacatita, Barra de Navidad, and Banderas Bay (Puerto Vallarta/La Cruz/Yelapa). 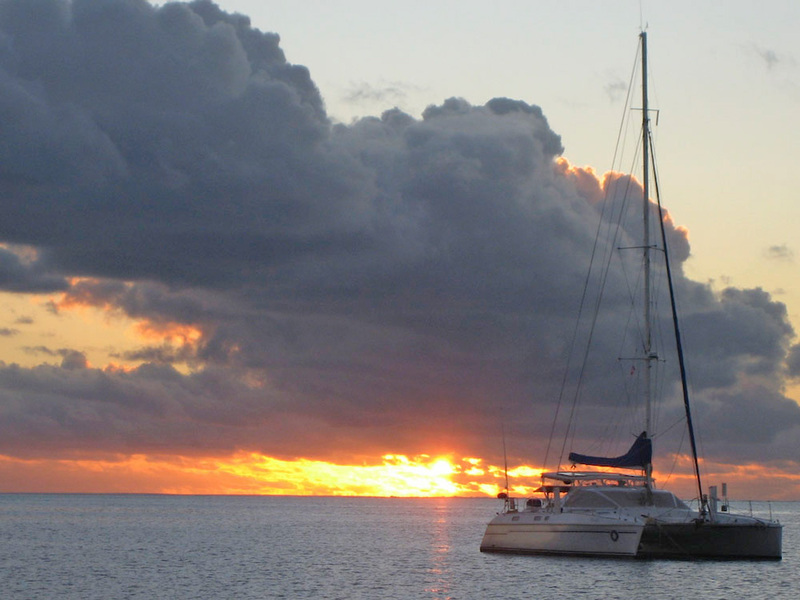 We left Mexico from Punta de Mita on April 19th, 2005, and arrived at Atuona, Hiva Oa in the Marquesas on May 10th—a 21-day passage over approximately 2900 open ocean miles. 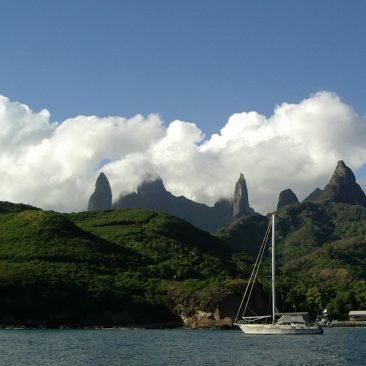 Atuona had changed quite a bit since the last time we sailed there 22 years before, arriving in 1983. Muddy roads were now nicely paved, cruise ships and supply ships navigated the tiny harbor to disgorge their various passengers and cargo, and SUVs now replaced horses. Everywhere seemed to bustle with purposeful activity. There was even a major marathon race in progress, and people came from all over the world to run it, arriving by plane at the small airport. 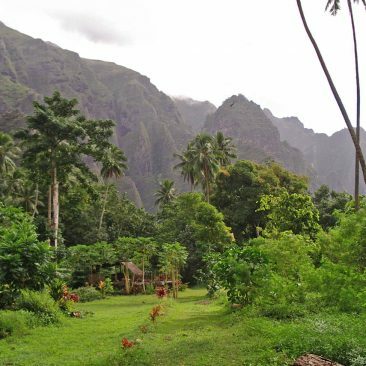 We had remembered a hot and muddy place with a slow and languid pace before, and now Atuona had morphed into a mostly French but also native-Marquesan artists’ colony. 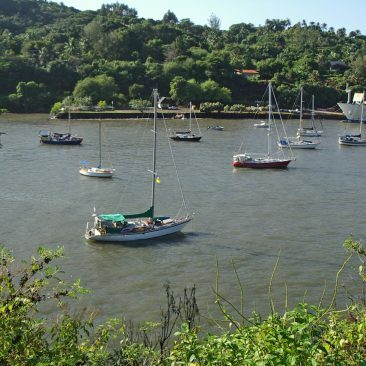 It had been “discovered” and, where we once shared the anchorage with a whopping 7 boats, there were now over 30—from all over the world—jostling for a place in the tiny, rolly, surging bay. A slight mishap at Taiohae on Nuku Hiva (the setting for Melville’s classic Typee and for the reality TV show Survivor: Marquesas) kept us from leaving the Marquesas sooner as originally planned: Nancy broke her arm while trying to avoid landing on the begging, stray dogs that appeared mid-step off a high wall—and breaking a leg instead! 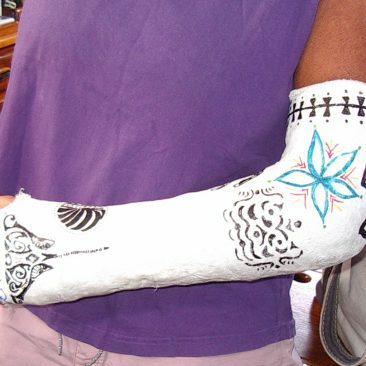 Luckily, the only x-ray facility within 900 miles was 5 minutes away at the main hospital for all six Marquesan islands, and, when she passed out from the shock, Good Samaritan locals were happy to rush her there in their jeep. 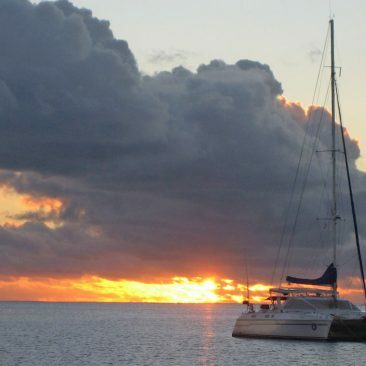 The accident definitely put a crimp in diving and swimming plans, but with the doctor’s approval, Shanachie was finally able to head for the Tuamotus—a 3-day sail away—with one rather incapacitated crew (who then caught a case of strep throat, too!). Weather was uncooperative during our stay in the Tuamotus, and navigating the passes at Ahe and Rangiroa was as wild and unnerving as we remembered from our last trip there in the 80s—without GPS (and only intermittent SatNav info)! 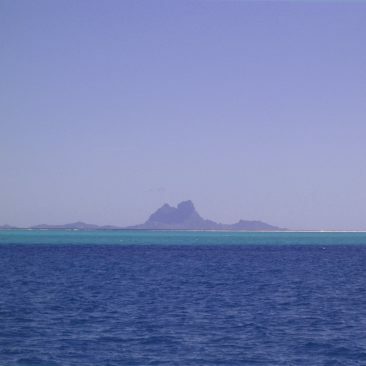 Still, the beautiful, very-warm water, easy-going friendly local people, nearly empty anchorages, and the deserted islands that ring the inner lagoons made the extra effort well worth it. 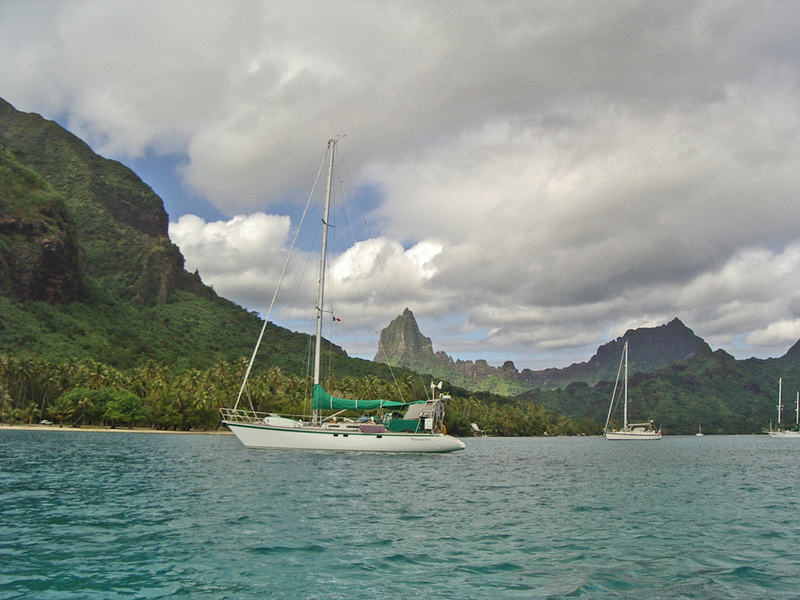 Eventually, we sailed on to the Society Islands: Tahiti, Moorea, and then 125 miles northwest to Huahine, Raiatea, Tahaa, and Bora Bora. We hauled Shanachie out on Raiatea, packed up, and reluctantly, flew home in time for Kali’s senior high school year (and varsity volleyball season!). At least Shanachie was left with a beautiful view of the sun setting over Bora Bora… until we returned, which we hoped would be sooner than later (and ended up being about 16 months!). 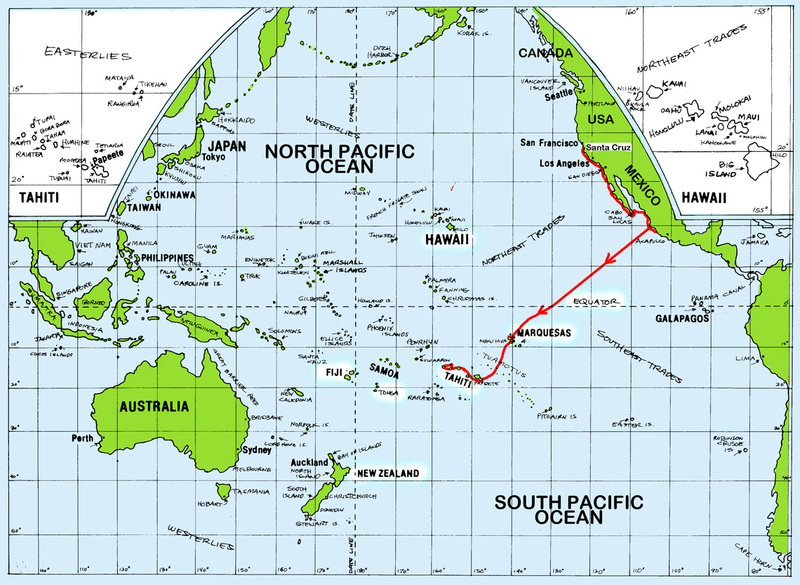 Following are a few photos from this leg of Shanachie’s ongoing adventures in the South Pacific. 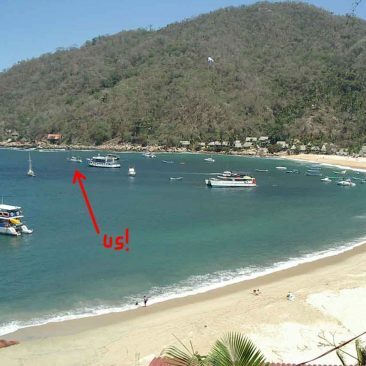 The anchorage off Yelapa in Banderas Bay, Mexico. 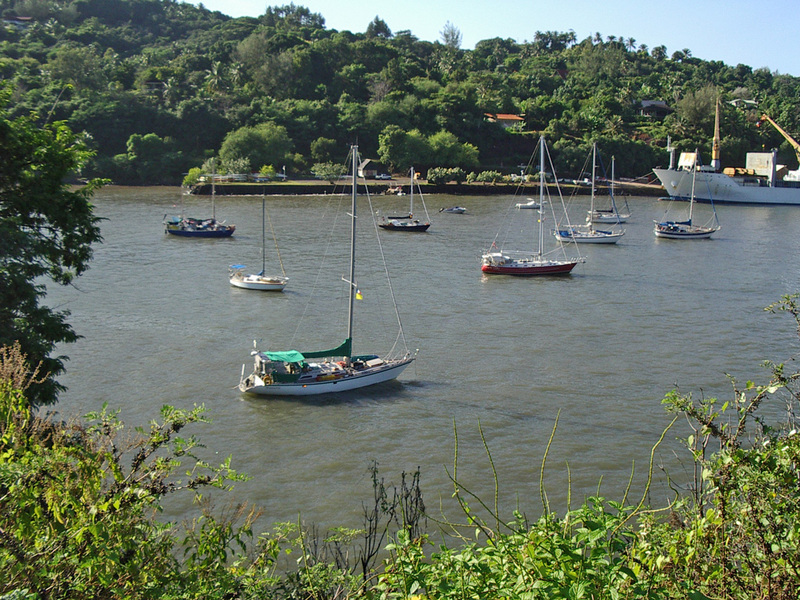 Shanachie looks like a toy behind the huge tourist boats that come and go every day. 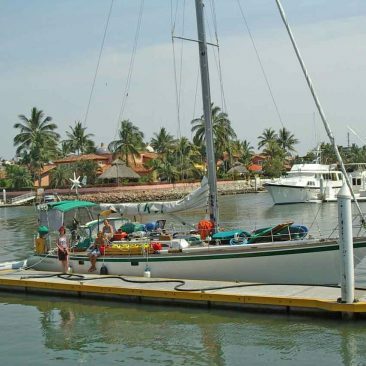 This is another “discovered secret” place that was nearly deserted when we sailed there 22 years ago… At least it is still only accessible by boat, but even that may change soon. Ready to blast off! 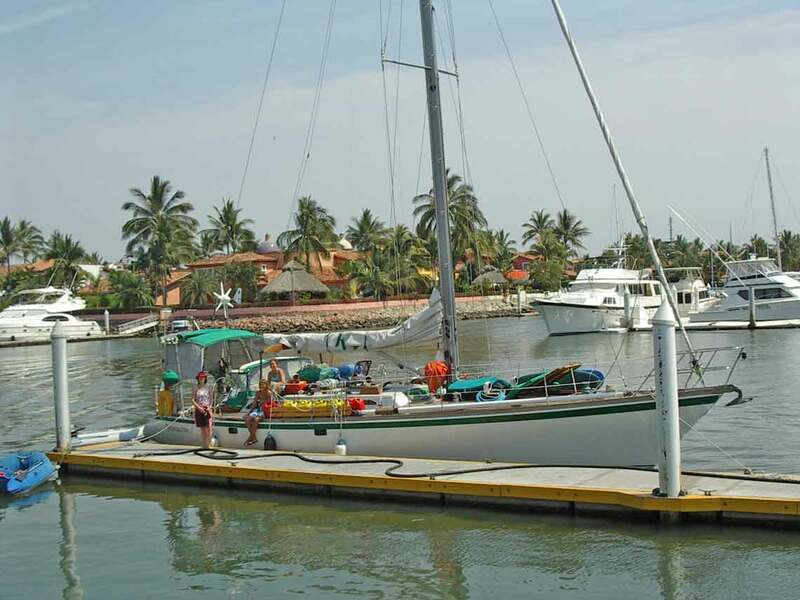 About to leave Mexico from Puerto Vallarta’s fuel dock for the passage to the Marquesas. 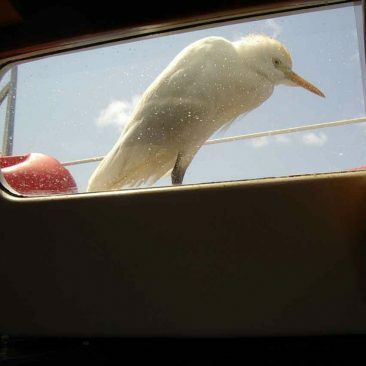 Our poor little cattle egret when he first arrived on board 350 miles off Mexico, perhaps blown offshore in high winds. 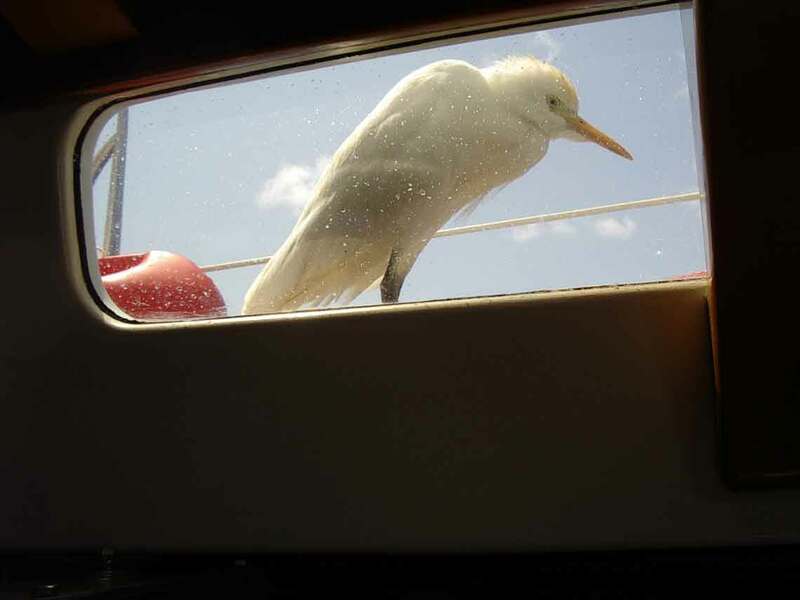 We named him Monsieur L’Egret, and enjoyed watching him stand fast on hardy sea legs, swaying to the rhythm of the boat’s motion, night and day. He lived for about 3 days, refusing all offers of food and water. He did peck at the glittering digital instrumentation readouts—apparently in search of insects. 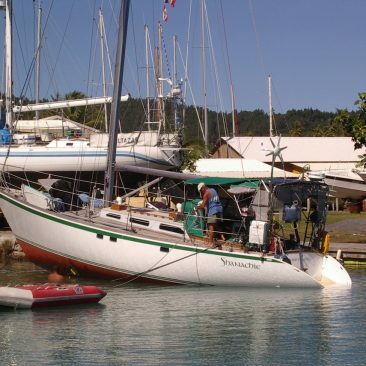 He tried to fly a few times, circling the boat, but always returned to Shanachie, until finally, weakened, he died. 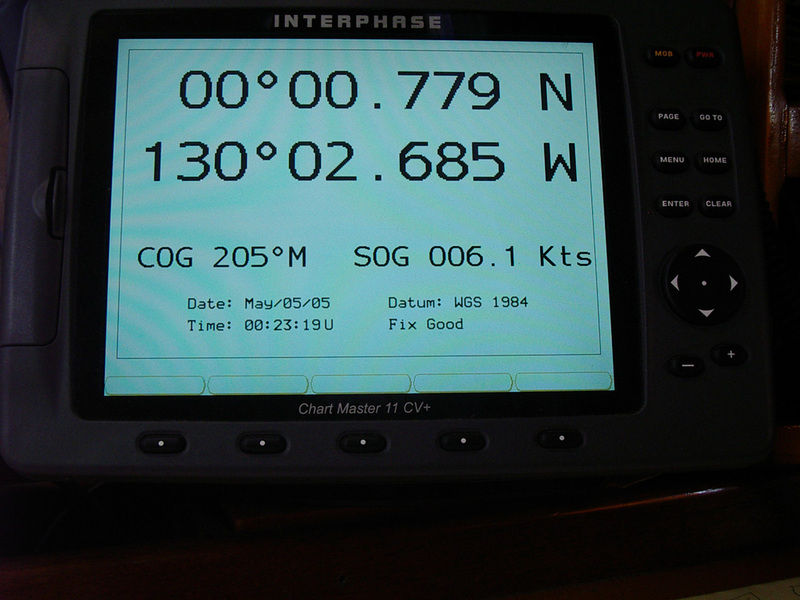 The GPS readout as we cross over the equator. 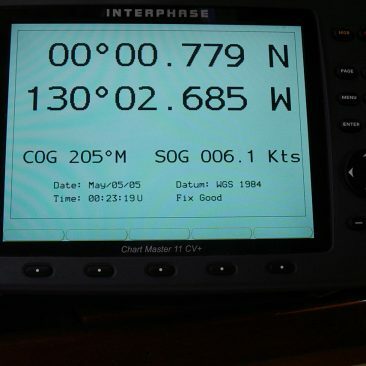 Our “course over ground” (COG) shows 205° Magnetic; our “speed over ground” (SOG) shows 6.1 knots—not bad for the doldrums of the equator. 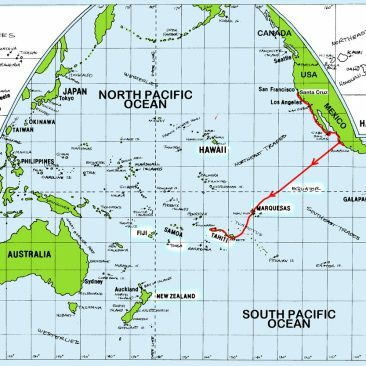 Kali transforms from a pollywog to a new “shellback” (one who has sailed across the equator) and tosses her message in a bottle at the equator on 05/05/05. Wonder who will find it, when, and where? Kali plots our position on the chart, at approximately 7° S, 136° W.
Looking down on Shanachie anchored at Atuona (foreground), almost exactly 22 years after the first time she arrived there. School’s in session (must be raining outside!). Kali hammers on trigonometry (or something! )… not an easy feat in the hot and steamy tropics. 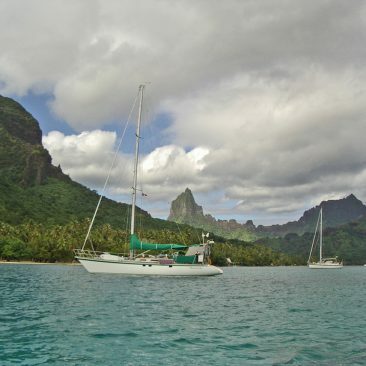 A Swiss yacht anchored nearby off the beautiful, brooding, heavy “mana” island of Ua Pou, Marquesas. 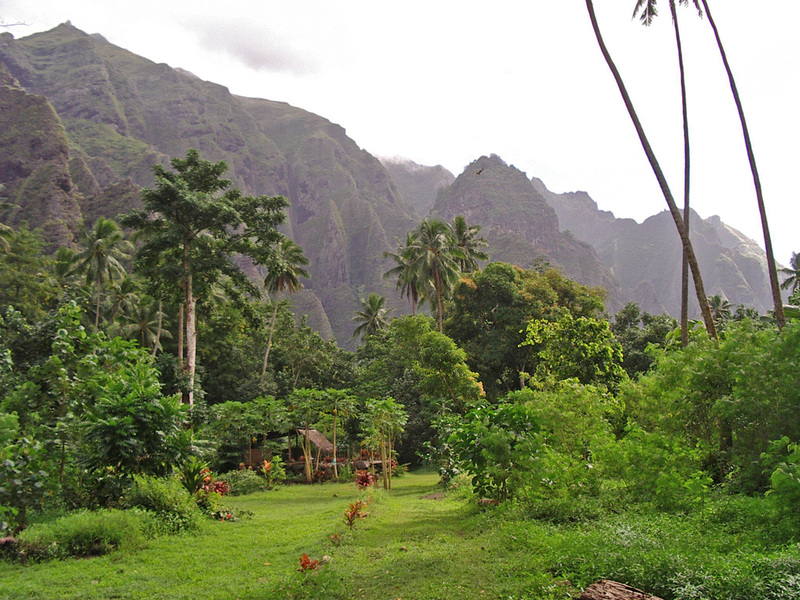 Daniel’s home at Daniel’s Bay, Nuku Hiva, site of the TV reality show Survivor Marquesas, which was not as remote from civilization as the show’s producers might wish viewers to believe. 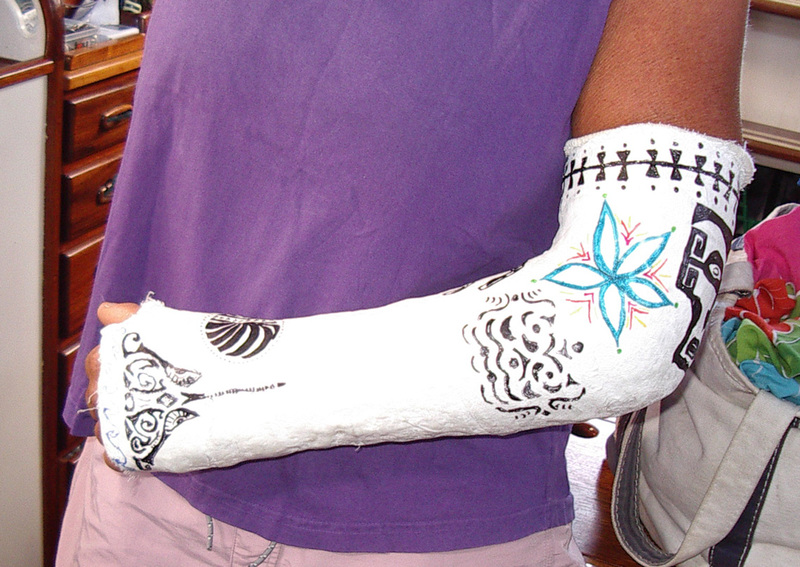 Nancy’s full arm cast with decorative tattoo art, contributed by various inspired artists. 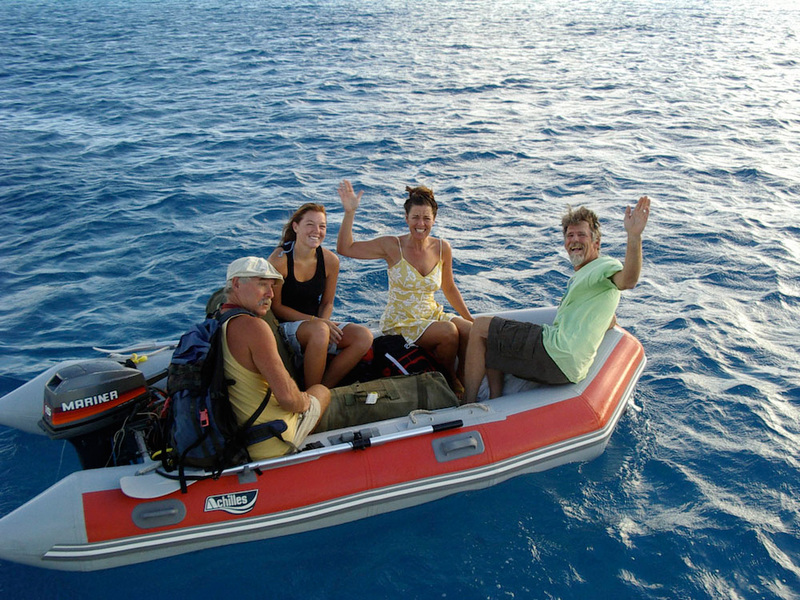 A very long 6 weeks later we had a Cast-away celebration on Raiatea, and Nancy was finally able to take her first dive into the warm tropical water (in pouring rain!) 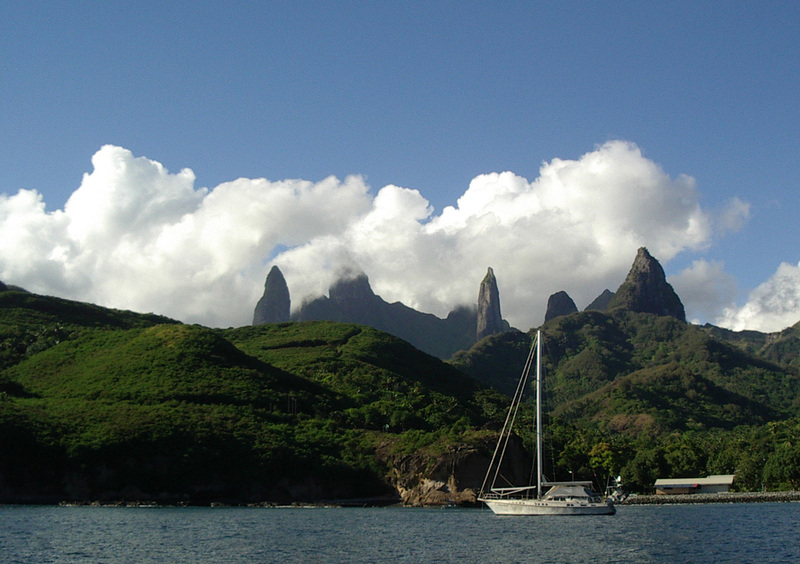 since before leaving the Marquesas. Sweet! 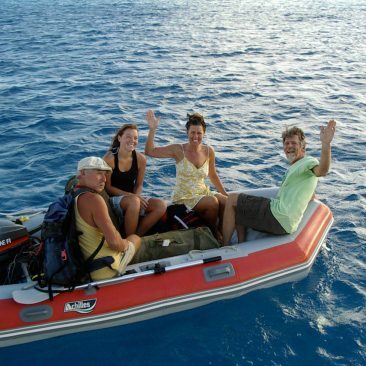 Shuttle to the Rangiroa airport: taking Gary and Louise—who sailed the passage with us from Mexico—to their flight outta there. Racing hermit crabs on a deserted island at the fringe of Rangiroa’s lagoon, Tuamotus. Kali viewing the sliver of beach on Huahine where she had lived as a baby for 6 months aboard Shanachie at anchor, while Dad (Joe) commuted to work by kayak as the first construction supervisor/foreman on the Hana Iti Hotel building project ashore. 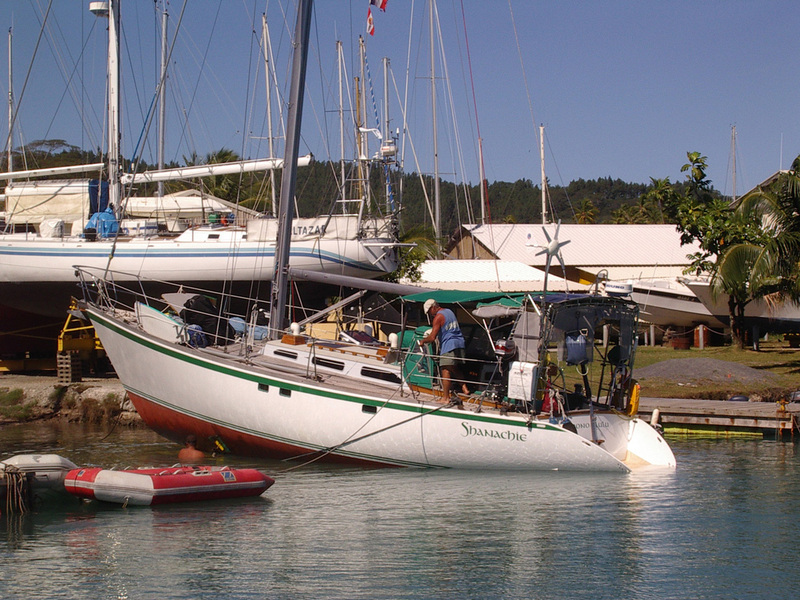 Hauling Shanachie out of the water for long-term storage. The Tahitians are diving under the boat to prepare it to be pulled out of the water (as opposed to being lifted with a sling—the more common method) with a powerful tractor and pulley system. 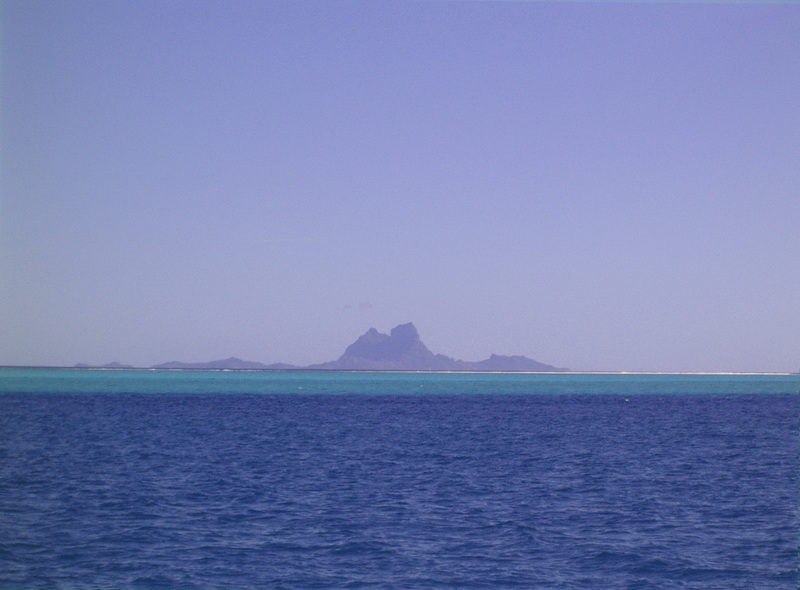 Shanachie’s view of Bora Bora from her place in the haulout yard on Raiatea, where she patiently awaited our return almost 16 months later, in December 2006.